Enjoy 3000 Free Minutes and MBs of Internet with Djuice SIM Lagao Offer. Now the Djuice customers can enjoy free minutes and mbs of internet with the sim lagao offer. The Dujice sim lagao offer lets you enjoy free 3000 on-net minutes and mbs of internet by putting back their Dujice sim into their mobile phone. All the Djuice customers who have not used their sims since 10th August 2018 can avail this offer and enjoy the incentives for the next 2 months. 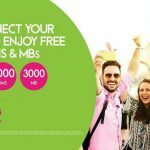 So if you are a djuice user and have not used your sim since 10th August 2018 it’s a great chance for you to have the 3000 on-net minutes and mbs of internet absolutely free for the next 60 days. All the Djuice customers can enjoy the free minutes and mbs of internet for the next 2 months after the subscription of djuice sim lagao offer. How to subscribe the Sim Lagao offer? You can subscribe the offer by dialing IVR 2222 from your mobile phone. The company has the right to withdraw offer anytime without notifying the customers. After the subscription customers will get the bounce on the same day almost within two hours. Customers will be able to get the 50 free minutes and 50 MBs free Internet under the sim lagao offer. The call set up charges are Rs.0.20 every time. If your SIM has been lost or damaged then you can get replacement SIM without any cost (Only once). It can be get from any Telenor Franchise during the duration of this campaign. For more information you can visit the Djuice official website. How to Avail Warid SIM Lagao Offer?